With the precious metals market on the rise, many collectors and investors have been purchasing bullion and rare coins. One segment that is appealing to many investors and collectors are silver bullion coins. If you are a reader of Numismatic News, you would have been reading a flurry or articles about the use of base metals over precious metals for our coinage. While both sides have their points, the fact remains that the base metal coins are legal tender and used in our daily transaction. But the appeal of precious metals was not lost on the US Mint when they create the American Eagle Bullion Coins. Since then, the awareness of collecting bullion coins has grown. As a collector, I like different types of coins. I was first drawn to the Silver American Eagles when my father started buying the proof coins for me. He has done this every year since 1986. I find the silver coins appealing for their look and feel. Not only are they a great collectibles, but their silver price has increased over the years. That is one of the reasons why I have been buying and hoarding uncirculated Eagles when I can find them at a good price. Since then, I have started to collecting Canadian Silver Maple Leaf bullion coins. For a simple coin, they have a beauty that I find intriguing. Canada has been producing the Silver Maple Leaf since 1988 and I am working on putting together a complete set. While hunting for nice examples of American Silver Eagle and Silver Maple Leaf coins, I found the Chinese Silver Panda. 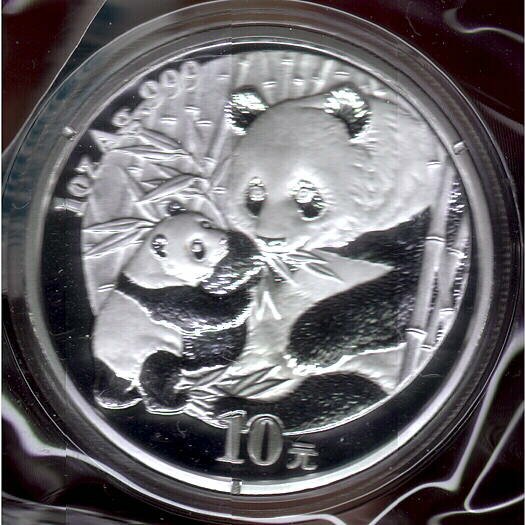 As I started to look into the Panda, I found that except for 1991 and 1992, all the reverse designs are different and the same design is used on both the silver and gold coins. I have found some nice, inexpensive gold Pandas through Internet auctions, but when I saw the silver Pandas I was excited. Not because they are more affordable than even the gold 1/20 oz. 20 Yuan Panda, but 10 Yuan 1 ounce silver Panda allows them to show the design on a 40mm diameter planchet of silver as compared to the 14mm diameter of gold. It is amazing what an extra 26mm of surface can do for a design. I recently bought my first two Silver Pandas in mint packaging from an Internet auction site. 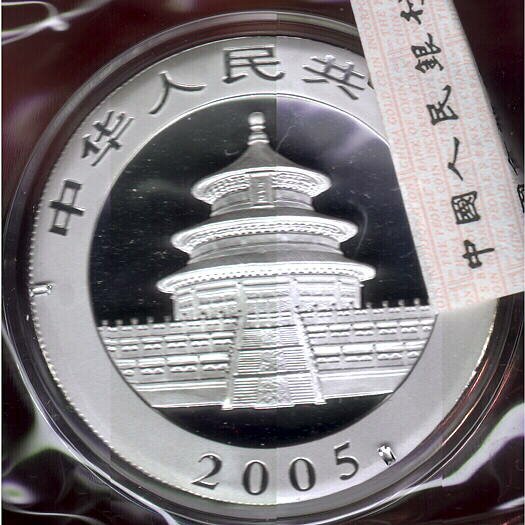 The common obverse has Chinese letters which is the title of the People’s Republic of China, the year of issue, and a wonderful proof-like engraving of Hall of Prayer for Good Harvests of the Temple of Heaven in Beijing. (click photo to enlarge) The reverse of the 2003 coin shows a single panda walking on all four legs through a bamboo forest. Although the China Gold Coin provides images of the coin, the real coin is more beautiful. The 2005 Panda design features a mother panda feeding her cub in a bamboo forest. 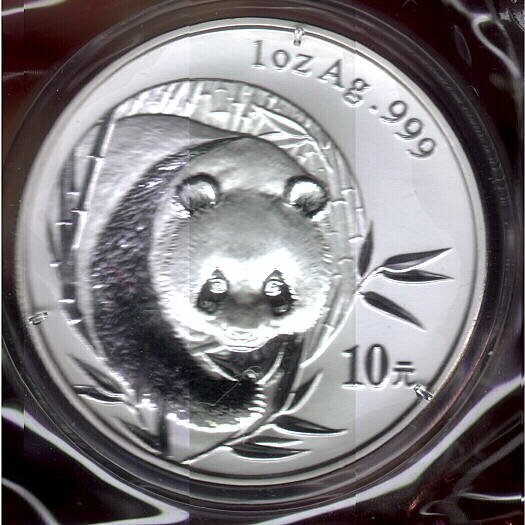 Although I do have a 1/20 oz gold coin of this design, the 40mm silver Panda is well executed and beautiful. The extra room for the design works very well with this design allowing the coin to pass the eye appeal test. I will be adding more Pandas to my collection. They deserve their place next to my collection of American Silver Eagle, Canadian Maple Leaf, and British Britannia coins. It will be a beautiful collection once it is completed.